In addition to Cosma's production record all time milk Careen also broke the record two year old milk and protein records. May herd test - Last one for 2014-15 season. Pretty impressed when the oldest cow in the herd tops the herd and second oldest cow is 4th top. April herd test results were very pleasing. A new highest ever April herd test and the fresh cows really milked well. I am especially delighted with the Camboge's that are on second lactation - if they all mature like this what will they be doing when they are 5 or 6 years old. Average was 19.9 litres [ 45.1 lbs ] 6.2% 1.24 kgs fat 4.5% 0.90 kgs ptn 2.14 kgs ms.
March herd test pretty impressive considering the dry weather. Been doing 2.00 kgs ms at factory - herd test was 19.0 litres 5.8% 4.5% 1.96 kgs ms.
New ms and fat record for Glenbrook. Glenbrook Chief Cybil GP picture taken two days after calving this season. Cybil has just broken the all time Glenbrook record for milk solids and also for fat. @ 6-8 she has 8674 litres 6.5% 561 kgs fat 4.2% 368 kgs ptn 929 kgs ms in 305 days. or 6-8 305 19,647 lbs 6.3% 1,237 lbs fat 4.1% 811 lbs ptn. This breaks Cosma's ms record by 7 kgs ms and her own fat record by 40 kgs fat. Due to dry conditions this months test is the lowest for this season whereas last season February had the highest herd test for the season. Average was 20.7 litres 5.9% 1.22 kgs fat 4.4% 0.91 kgs ptn 2.14 kgs ms.
January 2015 herd test results. December herd test not a record but still acceptable at 23.7 litres [ 53.7 lbs ] 5.30% 1.26 kgs fat 4.40% 1.04 kgs ptn 2.30 kgs ms.
Twin discussion from Glenbrook on Facebook. Classification resulted in 1 EX 4 VG and 5 GP this year. For a complete list see table at bottom of this page. 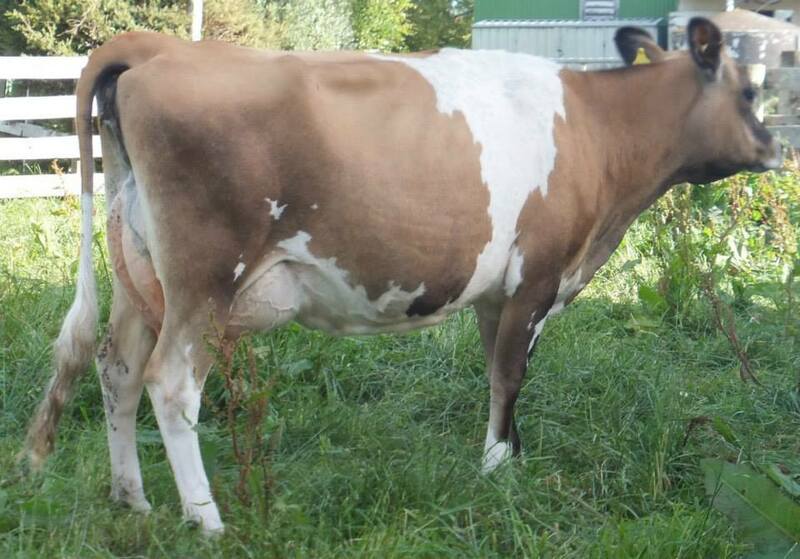 GLENBROOK CAMBOGE CELINE EX2 8-8 was high classified cow. November herd test average 23.8 litres 5.2% 4.4% 2.28 kgs ms. Sadly another really low herd test compared to the monthly average which would have been over 2.40 kgs ms a cow for the last month. Getting depressing to have 2 low herd tests in a row on the months that should be my highest herd tests. This test is the lowest for this season of any month. These the top producers for October. Herd average was a disappointing 2.35ms as that's the lowest day at factory for last 3 months and I struck herd test on same day. So no record month this time. 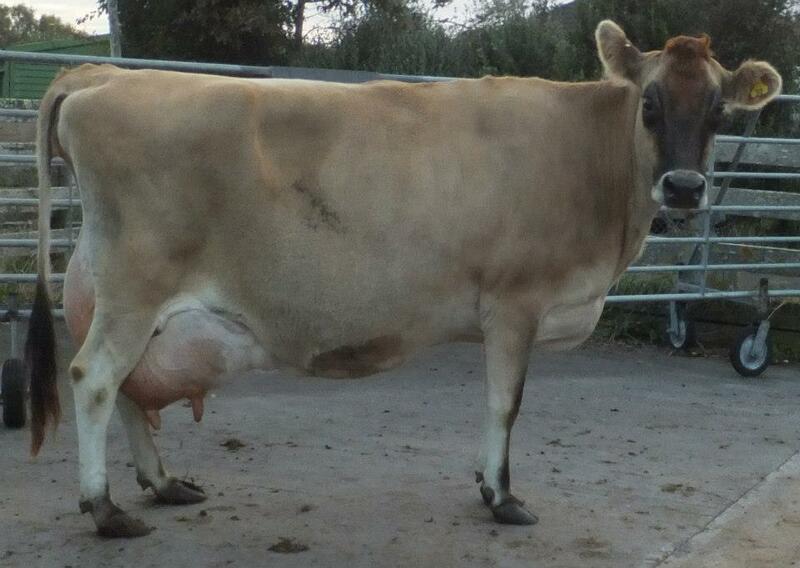 GLENBROOK COMMANDO CARINA 38.5... litres [ 87.2 lbs ] 5.1% 3.6% 3.36 kgs ms @ 8yrs . GLENBROOK MAXIMUS CAMBRIA 32.5 litres 5.5% 4.1% 3.14 kgs ms @ 4yrs. GLENBROOK MAXIMUS CORN 31.7 litres 5.4% 4.2% 3.04 kgs ms @ 5yrs. GLENBROOK FINAL COSMA 39.9 litres [90.4 lbs ] 3.8% 3.55 2.92 kgs ms @ 6yrs. GLENBROOK CONDUCT CAREEN 35.7 litres 4.3% 3.8% 2.89 kgs ms @ 3yrs. GLENBROOK CZAR CARNATION 32.3 litres 4.6% 4.3% 2.85 kgs ms @ 6yrs. GLENBROOK CONDUCT CONGO 30.5 litres 5.4% 4.0% 2.85 kgs ms @ 6yrs. GLENBROOK COMMANDO CHARO 29.2 litres 5.3% 4.2% 2.77 kgs ms @ 10 yrs. GLENBROOK MAXIMUS CLINK 30.0 litres 4.8% 4.4% 2.77 kgs ms @ 5yrs. GLENBROOK CHIEF CYBIL 6086 litres 6.3% 4.2% 636 kgs ms in 215 days @ 7yrs. GLENBROOK CHIEF CHRONICLE 5490 litres 6.4% 4.6% 601 kgs ms in 228 days @ 5yrs. GLENBROOK SAMS CAITIE 7100 litres 4.7% 3.7% 596 kgs ms in 228 days @ 6yrs. GLENBROOK COMMANDO CHARO 5632 litres 5.7% 4.1% 552 kgs ms in 194 days to date. GLENBROOK CRY CALIBRE 4684 litres 6.8% 4.6% 534 kgs ms in 218 days @ 12yrs. GLENBROOK CATS COLORADO 5083 litres 6.25 4.2% 525 kgs ms in 207 days. September herd test for Glenbrook is another record month - the 5th in a row. The herd averaged 25.9 litres [ 58.7 lbs ] which is the highest litres average for a herd test here. Average tests were 5.28% for fat and 4.16% for ptn resulting in a 2.44 kgs ms average the second highest herd test for any month. August herd test is new record for August and equal second highest for any month at Glenbrook. Herd average is 24.3 litres [55.0 lbs ] 5.6% 4.2% and 2.38 kgs ms. This is the 4th month in a row with an average over 2.30 kgs ms and these are the winter months. 2014 has now included 5 out of the 8 highest ever monthly herd tests at Glenbrook - proof that the breeding programme is working and line breeding is still viable in today's numbers and index dominated world. The fresh spring calved cows averaged 25.6 litres [ 58.0 lbs ] and 2.42 kgs ms. The autumn calvers averaged 22.4 litres and 2.31 kgs ms.
July herd test is another record month's herd test for Glenbrook. The autumn fresh cows averaged 24.1 litres [ 54.6 lbs ] and 2.49 kgs ms.
June herd test is another record herd test. Overall herd average was 21.6 litres [ 48.9 lbs ] 6.3% 4.5% 2.32 kgs ms - a new record for June and the 5th highest ms herd test for any month. TAG AGE CLASS T.O.P. TAG AGE CLASS T.O.P.